The Best Teethers for Baby: because it hurts! It's not always practice to make homemade teether solutions. Here are our favorite teethers when you need solutions. Available in grey, fuchsia and teal color options, this is a more portable version of the Chewbead necklace. It attaches to baby’s car seat or stroller for easy, on-the-go use. Sophie la girafe is very flexible and has lots of parts for baby to chew (ears, horns, legs). She is perfect for soothing baby’s sore gums when teething and is made of 100% natural rubber and food paint. This giraffe is not cheap, so don’t lose it! Also, try not to let water get up in the little hole (hard for a toy that goes in the mouth! ), as this has been cited for some serious mildew incidences recently. Don’t make it worse by submerging it in water, as there’s no very good way for it to dry out. Still, parents and babies love this soft, adorable giraffe. Reach for this all-natural teether and bath toy to introduce sensory play. It’s made from 100% plant-based rubber and designed with no holes to prevent icky bacteria from collecting. Turn bath time into playtime, soothe teething, and stimulate baby’s developing senses. Also comes in animal characters, broccoli, kale and more fruit and veggies. The adorable cookie silicone teether looks just like the oreo cookies without the added sugar and fat - And it gives good relief in teething pain! 100% FDA approved food grade silicone, BPA free. Comes in a variety of color choices on the silicone holder. As a mother you don't need help breaking every necklace you own, Chewbeads to the rescue! This is a cute accessory for a mom who needs a little splash of color, but is really entertainment/teething relief for baby (two birds, one stone). 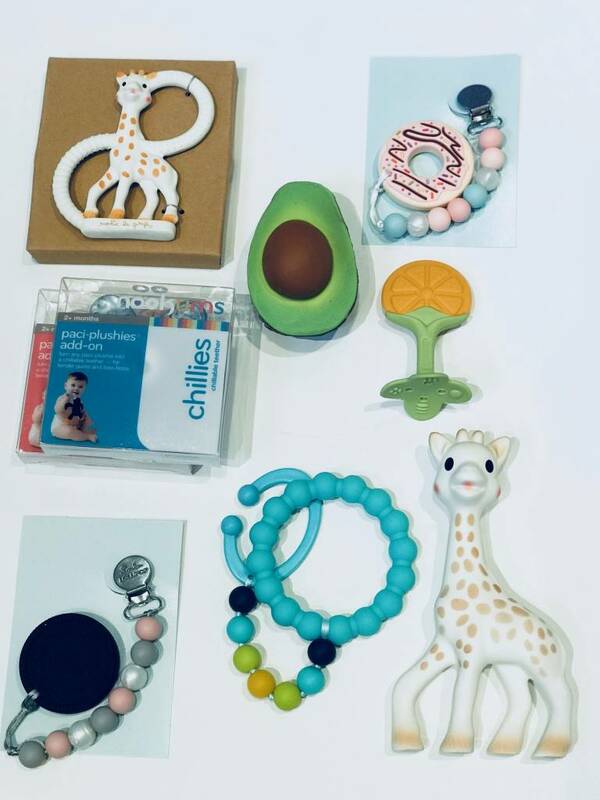 Innobaby’s fruit teethers aren’t just great for teething pain, they’re considered “training teethers,” which means they’re great for a bunch of different reasons. They stimulate the muscles of the lips, tongue, and cheeks to improve oral motor skills, which aids in nursing, eating solid foods, drinking from cups, and speech development. The light and easy to grip handle also improves hand-eye coordination. Giving two to baby will allow for bilateral movement and stimulation of both sides of the brain, as well. To sum it up, it's painful for Baby when teeth are popping in. And when Baby hurst, you hurt. I remember when my granddaughter's teeth were coming in. We purchased anything we thought would help her. We just knew it was painful and wanted it to stop! When something didn't appeal to her, we moved on to find the next thing. It took us seven purchases to find what worked for her. Hopefully you can use our experience and find your baby's favorite among this list.